Come to an exciting evening with recording artists and performers Sit Kitty Sit! Performing music from their nationally recognized new album, ‘Tectonic’ – As well as hits from past! In May of 2010, Kat Downs (Good Natured Mortals/Sparrows Point/Saints of Ruin) and Mike Thompson (Big Nasty/Tokyo Raid/Cougar Kick) teamed up to experiment with the combination of classical piano and rock drumming. Typically described as “The Dresden Dolls mixed with PJ Harvey and Muse”, the music they create also reflects evidence of Zeppelin, Beethoven, Rush and Rachmaninoff. The combination of Kat Downs’ ornate hands and hair flying with Mike Thompson’s percussive mastery makes this duo the consummate definition of a “dream-team”. No holds barred, this group produces addictive rock n’ roll – with only two people and not one guitar in sight. 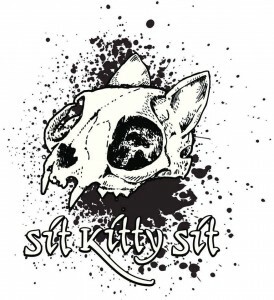 Visit www.sitkittysit.com for all the latest news and tour updates! (Dinner and drinks package) $35 for dinner and 4 drink tickets per person (house wine, well drinks, domestic beer). Dinner is a set menu of 4 items including your choice of either Tri-tip, Salmon, Crown Point Chicken or Spinach Ravioli dinners. Includes Entertainment! Please use the reservation sheet below to sign up for this event! If you have not made reservations (below) 24 hours prior to the event it will be $5 more or $40 total at the door. (Special drink prices – All Night Long) – $3.50 for all Well drinks, house wine, & Domestic beer. What time would you like to have dinner? This is the $35 dinner and drinks package. Note: Show starts at 7 p.m.! 5:00 p.m.
Ghost Tour Tonight at the Gold Hill Hotel! SOLD OUT TONIGHT! !